Yes, we heard your feedback! We’re happy to announce that Passenger No-Show Cancellation Feature is now available to all driver-partners! This feature will now enhance your experience as a valued driver-partner, empowering you to drive with a greater peace of mind. If the passenger does not show up after you have waited for the passenger at the pick-up point, you can cancel the job with the assurance that your Cancellation Rate remains unaffected. If any of these are not met, the ‘Passenger no-show’ option will not appear, and your Cancellation Rate will be affected if you decide to cancel the job. [UPDATE!] We’ve added more cancellation reasons that will allow you to cancel jobs without affecting your Cancellation Rate (CR)! Click here to know more. What is the Passenger No-show Cancellation Feature? It’s a feature that empowers you as the driver to cancel a ride if the passenger does not show-up after you have waited for 5 minutes (3 minutes for GrabShare). Using this feature will ensure your Cancellation Rate will not be affected when a situation as such happens. Must I tap on ‘I’ve Arrived’ button once I arrive at the pick-up point? Yes. To use the Passenger No-Show Cancellation Feature, please tap ‘I’ve Arrived’ first once you arrive at the pick-up point. The feature will not be available if you try to cancel before you arrive at the pick-up point. You will receive a notification that your current location does not match the pick-up point. It is okay if you have tapped ‘I’ve Arrived’ before reaching the pick-up point, just make sure you only press ‘Yes’ in the notification message once you’re at the pick-up point if you wish to use the feature. How long must I wait at the pick-up point before cancelling using ‘Passenger no-show’? As per our current practice, please wait at least 5 minutes (or 3 minutes on Grabshare) at the pick up location for your passenger, before using the Passenger No-Show Cancellation Feature. The passenger did not show up and I’ve already driven off. When I try to cancel the job using ‘Passenger no-show’, the option isn’t available. Why is this so? 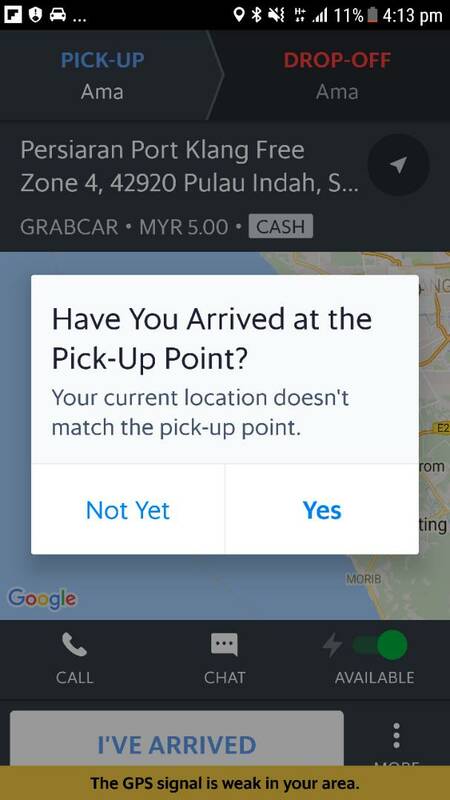 If the passenger does not show up after 5 minutes (or 3 minutes for GrabShare), you need to cancel the job while still at the pick-up point. The feature will not be available if you try to cancel after driving off. How about the other situations whereby the passenger books the wrong vehicle type. How can I cancel these jobs without affecting my CR? At present, the feature only works with the stated criteria. Rest assured, we are working on improvements to cater for other cancellation cases. Stay tuned! Yes. Please ensure that you’re on Grab Driver App version 5.34.0 (Android) / 1.21.0 (iOS) and above.